Like many other Italian composers before him (Rossini, Bellini, Donizetti just to mention the main contemporary ones), Verdi was invited to compose for the Parisian stages. It was decided to stage a grand opéra as it was fashionable since the 1830’s. But instead of composing a brand new opera, Verdi adapted one of his earlier operas, I lombardi alla prima crociata. The writers of the libretto Royer et Vaëz rewrote the plot (which makes more sense than the Lombardi one) while Verdi re-adapted and rewrote bits and pieces. The result is not really a grand opéra in the sense of Meyerbeer, Halevy et al. It sounds like any contemporary Verdi with all his characteristics and flaws. So if you like Verdi you probably liked this one as well, if you were expecting a grand opéra you probably were disappointed. Mazzonis di Pralafera and Jean-Guy Lecat provide red-bricked columns on each side, a wall at the back and a painted decor with an otherwise empty stage (except cushions for Gaston’s aria in act III, hastily removed for the ballet). Beautiful the costumes shaped as idealized and colourful Middle Ages apparel. The ballet was the only modern bit in an otherwise traditional setting and although i liked some parts, the performers danced in a modern, hectic, nervous kind of style. Speranza Scappucci does her best to keep it going though I again miss the extra bit to make the music sparkle. Marc Laho’s voice expands well, his registers equally even; a fine interpretation. 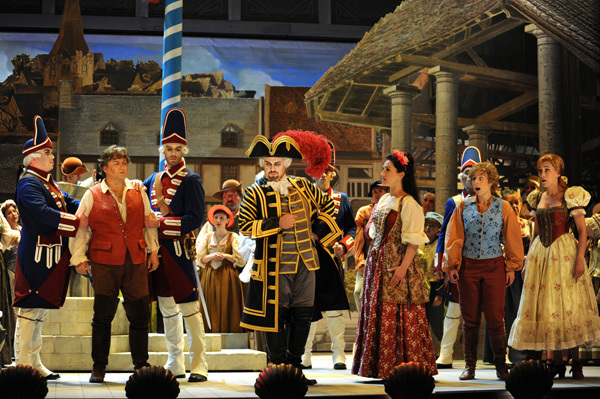 Elain Alvarez and Roberto Scandiuzzi both had some issues with very low or high notes in act I. Maybe not warm enough? But in the following acts Scandiuzzi developed his beautiful bass voice and was a delight as Roger (and hermit). Elain Alvarez has a somewhat “slow” voice, her embellishments not very light and and the interpretation lacked the punch of the Verdi heroines. Overall i preferred her Hélène to her Elvira 2 years ago, but was not fully convinced either. André Ernest Modeste Gretry is one of those fairly forgotten composers whose operas receive rare but regular revivals. Gretry was born in Liege in 1741. Then Principality of Liege, the city became part of France in 1795 when it was part of the Ourthe department. At the Fall of the First French Empire it became Dutch and in 1830 Belgian (we opera lovers know this story quite well. Thanks, Auber!!). Gretry wasn’t touched in the least with all this, as he left for Italy, Switzerland and Paris already in the 60’s of the 18th century. He became quite a famous composer, he knew Voltaire and Rousseau; later-guillotined Marie-Antoinette made him court-composer of her husband, and he found a way to ingratiate himself with Napoleon who knighted him Chevalier of the Legion of Honour. He died in 1813, is buried in the Pere-Lachaise cemetery in Paris but his heart rests in an urn, placed under the statue in his honour in front of the Opera Royal de Wallonie in Liege. His most famous opera’s are Richard Coeur de Lion, Zemire et Azor, and Pierre le Grand. Guillaume Tell was premiered 9th April 1791 in Paris at the Comedie Italienne, two years after the French revolution. It was the same year of Mozart’s Zauberlföte (which he started to compose in April of that year), of La Clemenza di Tito, of the Clarinet Concerto and of Mozart’s death in December of the same year. Gretry’s biggest accomplishment lies in opera comique and his influence is still noticeable with Adam, Boildeau, Auber and others. For today’s ears (or MINE, anyway) he sounds fairly “light”. Although Gretry has been praised to have a gift for melody, the music overall sounds quite trivial, alternating more dramatic passages and characters with heroic and affectionate ones. He recurs to ariette (literally small aria’s), hopping rhythms and popular songs with simple accompaniment, using as couleur-locale a clarinet playing alpine music, octave leaps to imitate yodel and similar know-how, trying to merge italianism with German music and French declamato. It is the Opera de Liege, who commemorates the 200th death anniversary of the composer. This opera house is doing a very good job in resuscitating rare opera’s, though with very alternating results. If the audience expected to hear a famous finale, an even more famous gallop during the ouverture, and cry a little moved by tragic events, they probably mistook this with Rossini’s Guillaume Tell, composed 38 years later, although Rossini might have known the opera, which was staged in May 1828, the time Rossini worked on his Comte Ory (In an interview Scimone said that he noticed in the first bars of music the musical theme that Rossini used for his sumptuous finale (with a light difference in rhythm, he added). The plot is well known to everybody: Tell refuses to salute a hat placed on a mast by the mean local lord and is forced to shoot an apple from his son’s head. The end is happy. The singers are all Belgians, commemorating a Belgian composer in a Belgian opera house…..
Anne-Catherine Gillet is very well cast as Madame Tell. She is at the starting ramp of her career and is now adding Traviata’s to her repertory (sic!). M.me Tell, who is the only character to have an aria in the opera, sings with a strong voice over the whole range, though her voice sounds a bit metallic at times. Marc Laho as Tell has a clear voice with a pleasant timbre. Lionel Lhote never really convinced me as a singer (Figaro in Rossini’s Barbiere in Ghent, Dandini in Brussels etc), sometimes a bit unrefined and uneven with a backward voice. As Gessler he lacks the low notes required in his entrance piece but otherwise he sings with a pleasing timbre. Liesbeth Devos’ timbre reminds me a bit of Mady Mesplé’s, so not one you would define as round and mellow, but she sings the small role of Marie well. And so does the rest of the cast. Scimone directs well though little theatrically, but orchestra and choir are both approximate and croaky. This production is overall very interesting, it increases our knowledge of Grétry as a composer of music for the theatre Nothing is really out of place, the production is sparkling and satisfying. A very pleasant evening.